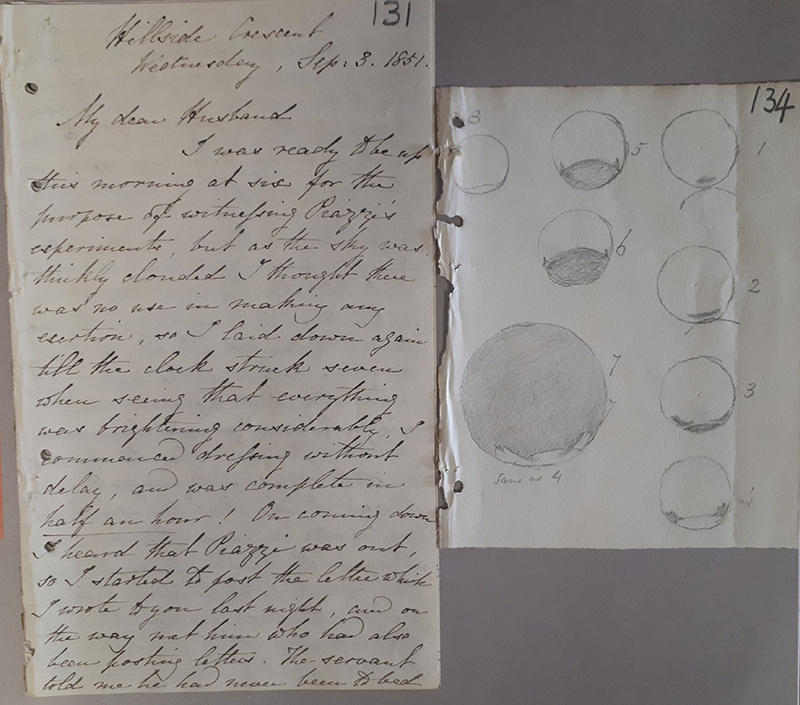 On 29 June 2018, Cambridge University Library will host a workshop on the life and work of the seventh Astronomer Royal, Sir George Biddell Airy (1801-1892). The selection of Cambridge for the workshop reflects Airy’s close connections to the town. He was not only a student at Trinity College, but also held the positions of Lucasian Professor (1826-1828) and Plumian Professor (1828-1836) at the University. Airy’s early correspondence within the RGO Archives of Cambridge University Library provides historians with an insight into how the young astronomer gradually entered the established networks of nineteenth-century science . Covering this time period, at the upcoming workshop, Simon Schaffer will present on Airy’s directorship of the Cambridge Observatory , while Stephen Courtney will discuss the influence of Airy’s uncle (Arthur Biddell) on the education and early career of the young Airy. His appointment as Astronomer Royal meant that Airy and his family had to move from Cambridge to the Royal Observatory at Greenwich. The talk by Louise Devoy (Curator at Royal Museums Greenwich), based on the exhibition “Observatory Life”, will tell the story of how the Airy family lived in their new surroundings, and will highlight the loving relationship that George and Richarda Airy maintained in sickness and in health. 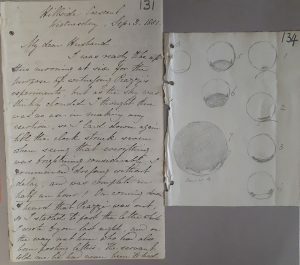 While many of Richarda’s letters have not survived, those that remain show her contribution to and support of Airy’s projects, such as her drawings of a solar eclipse . This loving and caring side of Airy was absent in Maunder’s (1900) popular characterisation of the astronomer as a ruthless disciplinarian. The talk by Jenny Bulstrode titled “Beer and Bad Dreams” will similarly attempt to recover the humane side of Airy by reflecting upon his strong engagement with his own bodily knowledge. This lighter side was evident, for example, when Airy and his daughter sang with “Irish devilry” the folk song Sean-Bhean Bhocht , when he “jeered at [Sir William Rowan Hamilton] for drinking nothing but water” , and in the lines of his derogatory poem about Babbage’s difference engine . As Astronomer Royal, Airy expanded both the departments and the instrumentation of the Observatory. Lee Macdonald will discuss the conflicts that arose around establishing a Magnetic and Meteorological Department , while Daniel Belteki will focus on the re-instrumentation of the Observatory between 1840 and 1860 . The site and various departments not only brought together men of science, but also instrument makers and engineers. Edward Gillin’s talk will focus on Airy’s relationship with railway companies , while Ken Corbett will analyse the changes caused by the introduction of electrical timekeeping both inside the Observatory and around Britain . Registration for the workshop (which includes a light lunch) is available free of charge, but only a few tickets remain. If you are interested in attending, please register here. RGO 6/805, 807 & 808. ‘This is the Engine that Charles built’, 1851 June 20, RGO 6/452: 282-291. Bell, E. T. (1937) Men of Mathematics. New York, Simon and Schuster. Forbes, G. (1916) David Gill: Man and Astronomer. London, John Murray. Maunder, E. W. (1900) The Royal Observatory Greenwich: A Glance at its History and Work. London, The Religious Tract Society.